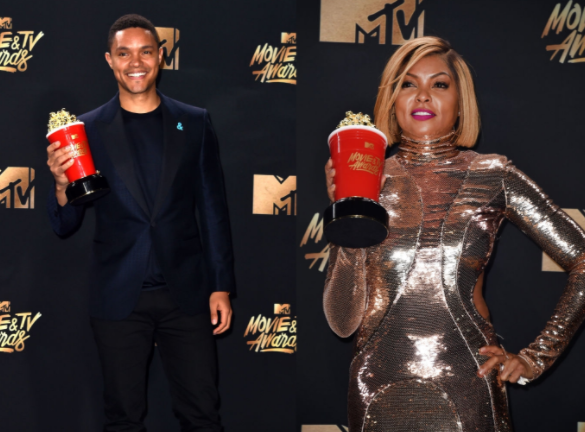 Home / awards / Celebrity gists / MTV Movie & TV Awards 2017: Complete list of winners..
MTV Movie & TV Awards 2017: Complete list of winners..
Last night, Adam DeVine hosted the newly revamped MTV Movie & TV Awards live from Los Angeles, where "Get Out" led the pack of both big and small screen contenders with 6 nominations. Movie of the year: "Beauty and the Beast"
Best actor in a movie: Emma Watson, "Beauty and the Beast"
Show of the year: "Stranger Things"
Best actor in a show: Millie Bobby Brown, "Stranger Things"
Best kiss: Ashton Sanders and Jharrel Jerome, "Moonlight"
Best villain: Jeffrey Dean Morgan, "The Walking Dead"
Best host: Trevor Noah, "The Daily Show"
Best reality competition: "RuPaul's Drag Race"
Best comedic performance: Lil Rel Howery, "Get Out"
Best hero: Taraji P. Henson, "Hidden Figures"
Tearjerker: Jack and Randall at karate, "This is Us"
Best duo: Hugh Jackman and Dafne Keen, "Logan"
Best fight against the system: "Hidden Figures"
Trending award: "Run the World (Girls)" feat. Channing Tatum as Beyoncé, "Lip Sync Battle"
Best musical moment: "You're the One That I Want" from "Grease: Live"